Birds of Nebraska - Online > News & updates > Are certain species over-reported? This article originally appeared in the August 2018 edition of The Burrowing Owl, the newsletter of the Nebraska Ornithologists’ Union. As Seasonal Reports Compiler for Nebraska Bird Review and an eBird Reviewer for three regions in Nebraska, I might have a unique perspective on trends in reports of Nebraska bird sightings. Although my personal biases come into play, the following are a few species that I think are over-reported to eBird and NEBIRDS and should be reported with at least details on their identification. These species are ones that raise questions in my mind about the accuracy of our knowledge about their occurrence in Nebraska. Perhaps eBird filters could be tightened so as to monitor for a while the accuracy of submitted sighting of these species. First off, the vexing issue of hybrids: reports of American Black Duck and Glossy Ibis should be made with care to at least minimize the possibility that the sightings are of hybrids. Although there are great photos available of Glossy Ibis showing no visible hybridization, I am sure that not all of the remaining reports are of pure Glossies. Recently, American Black Duck has become a rare bird, which increases the likelihood that reports are of birds having some level of introgression (subsequent generations after the first cross between different species, which is the only cross that produces a true hybrid); greenish feathering on the head is a good indicator. Reporters of American Black Duck should be aware of the possibility of Mottled Duck, which may be currently as likely as pure American Black Ducks, especially in April–May. 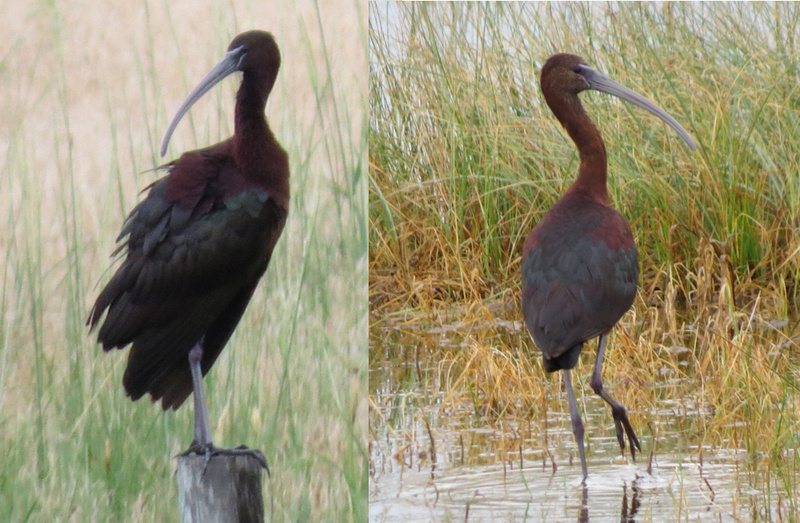 Glossy Ibis (left) and an apparent Glossy X White-faced Ibis hybrid (right) in Garden County 21 July 2015. Reports of apparently pure Glossy Ibis and purported hybrids have increased in recent years. There are some indications hybrids may be increasing at a faster rate than Glossies in the Great Plains, so observers need to be cautious when identifying either Glossy or hybrid ibis and whenever possible, obtain photos. Photos by Joel G. Jorgensen. Black-billed Cuckoo is a rarity in Nebraska these days; reporters should try to record calls of “heard-only” birds or obtain photos to clinch the identification. On the topic of photos, reports of Philadelphia Vireos should be documented, especially in fall when young Warbling Vireos are more yellowish than might be expected. The darkness of lores also is quite variable among both Warbling and Philadelphia vireos. The best mark is the location of yellow coloration on the underparts, assuming, as with Empidonax Flycatchers, lighting conditions allow accurate assessment of colors. Check out http://eontbird.ca/?p=652. 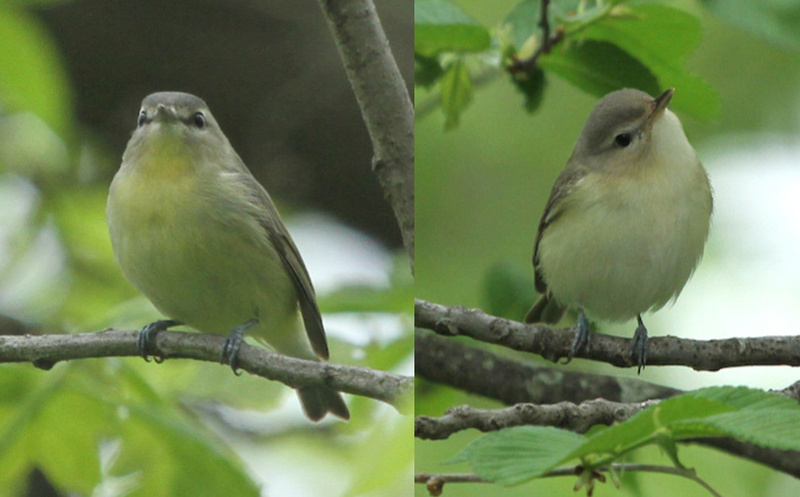 Both of these vireos show noticeable eye lines and gray caps, but the yellow throat on the bird on the left is key to identifying that bird as a Philadelphia Vireo. The Warbling Vireo on the right has a white throat. However, both of these photos were captured in spring (12 May 2018 at Platte River State Park). In fall, identification is more challenging as Warbling Vireo can possess more yellow tones on the underparts, but observers should still focus on the intensity of the yellow on the throat. Photos by John Carlini. It is well-known that several species have elliptical migration patterns, most of those occurring in Nebraska being common in spring and rare in fall. Shorebirds are well known for such differential patterns by season. In Nebraska, notable are the Hudsonian Godwit and the White-rumped Sandpiper, neither of which are expected to occur in Nebraska in fall. Even some passerines undergo elliptical migrations, perhaps the best-known of which is the Blackpoll Warbler, which takes off in fall southward across the Atlantic Ocean after staging along the northern Atlantic Coast. Fall reports of these three species should be accompanied by diagnostic photos. There are a few species that are reported in the east that also need to be reported with photos; very rare in the “far east” (Missouri River and the next west tier of counties) are the Ferruginous Hawk and the Dark-eyed (Pink-sided) Junco. Most if not all Ferruginous Hawks that occur in the far east in fall and winter are expected to be immatures, which can be a tough identification among the array of variation of Buteos there at that time. Juncos occur in a wide array of plumages in winter, especially Dark-eyed (Oregon) Juncos; pinkish- or cinnamon-red coloration can occur in a few different subspecies and there is probably a range of introgressants to deal with as well. Reports of Dark-eyed (Pink-sided) Junco in the east should be accompanied by photos; pure Pink-sideds are strikingly colored birds readily identifiable, but some Oregon Juncos can resemble, albeit on a much lesser level, Pink-sided Juncos. Dark-eyed (Pink-sided) Juncos are rare in far eastern Nebraska but imposters that belong to the “Oregon” subspecies or introgressants of this and other races are regular and can appear superficially similar to Pink-sided Juncos. An important field mark are the dark lores of Pink-sided Juncos, which imposters generally lack. 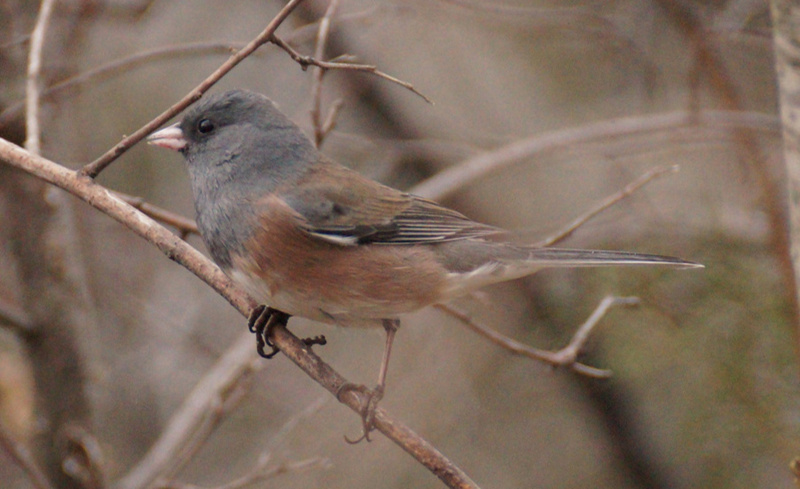 This Dark-eyed (Pink-sided) Junco in the above photo at Harlan County Reservoir 13 Dec 2014 has slightly darker lores, but many Pink-sided Juncos’ lores are much darker and show more contrast with the gray hood. Photo by Joel G. Jorgensen. More information about these species can be found in individual species account on this website.